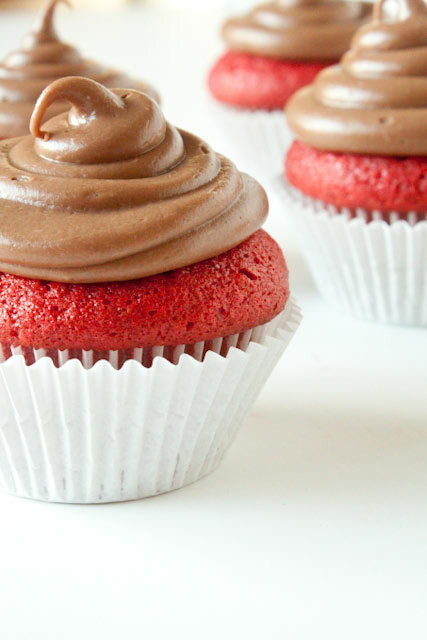 With Valentine’s Day on the horizon, red velvet cupcakes have been the only things occupying my thoughts. I just had to have them. And the fiery pop of color was purely a holiday perk. The feat was to update the classic recipe. The cake itself seemed too tried and true to be tampered with, so I opted to play with the frosting. Plain cream cheese frosting is one of life’s most luscious sweets. I, for one, would gladly eat it by itself with a spoon. But to make the traditional recipe even richer and give it a twist of flavor, I decided to add a bit of chocolate—and not just any chocolate. The resulting icing tasted like chocolate cheesecake on top of my cupcake. Silky, ultra smooth and cocoa-infused with just a hint of hazelnut. If you don’t already have a Valentine, this will win the heart of one for you. Beat the softened cream cheese and Nutella with an electric mixer on high speed until well blended and completely smooth. Gradually add the powdered sugar, beating on medium speed between additions. Beat on high until powdered sugar is fully incorporated. Scrape down the sides of the bowl, add milk, and continue beating until frosting is light and fluffy, about 3 full minutes. *Note: Because of its silky, melted fudge texture, this frosting is best spread on cakes and cupcakes with a spatula, rather than piped on with a pastry bag. You may have the urge to add more powdered sugar to make it stiffer in order to yield a better texture for piping, but beware that the frosting can quickly become much too sweet. In my first attempt at this recipe, I added a whopping 4 cups of sugar to create a proper pipe-able frosting, only to discover the finished product was cloyingly sweet. These look amazing!! But where’s the red velvet recipe? I’m hoping the otherworldly sour cream fudge birthday cake recipe makes an appearance, too. You know, in case my son asks for one as his cake this year. In early April. I love the idea of a dark chocolate filling. And I really wish I could share the sour cream fudge cake with you because it is the best birthday cake in the world, but it’s going in my first book so I can’t share it just yet. I can totally wait for the book, no worries! I’m glad to hear that it’s being showcased – something to look forward to. I can’t speak for everyone, of course, but I’m just thankful for the blog and all that you already give. 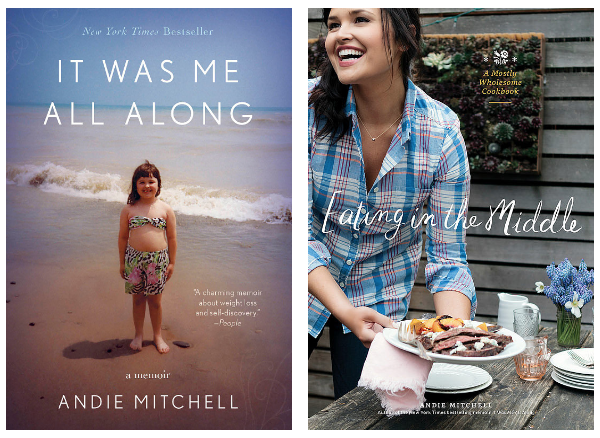 The books feel like, well, frosting on the cake. :). We’re here, we support you, and we’re looking forward to celebrating those big days with you, whenever it’s time! Alright. So you just posted this today and it looks like you’re responding to a few comments. My hope isn’t necessarily that you’re going to respond to this; I just want you to see it. You’re amazing. Your cooking is amazing. Your photography is amazing. Your stories are amazing. As a self appointed “google chef,” I have found no other website to even come close when I look for things to cook. I love making dinner now because of you. I do it for my friends too, all the time, because of this website. You’re truly an inspiration. Thank you for all your posts. I’m so glad they’re on a regular basis, and I hope they continue to be that way. This is the kindest, most loving comment, and I’m not even sure I can begin to deserve it. All I can do is thank you. I’m so grateful to have you here. Not only is it almost Valentine’s day, but it was just World Nutella Day, so this treat is very timely! Yum. 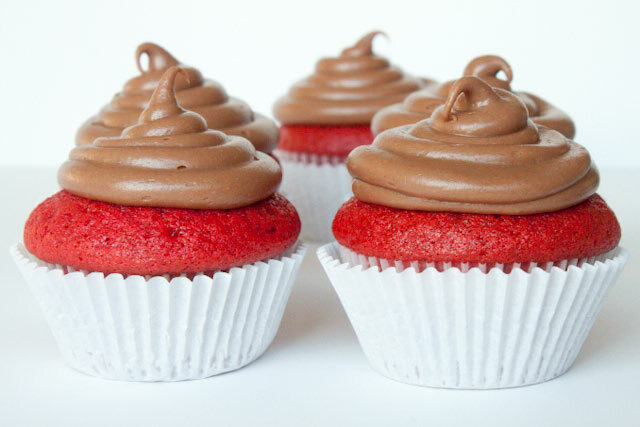 I made Nutella buttercream once, best stuff ever! 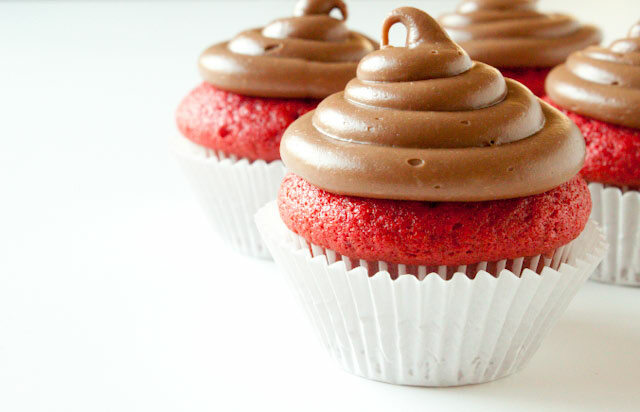 Really wish I had one of these gorgeous cupcakes for after lunch! Guess what MY honey is getting for Valentine’s Day? And by honey I mean me, and by Valentine’s Day I mean every day of my life. I love the top photo, amazing! Clean and colourful and bright. i might just make the frosting to eat. =) my boyfriend (the pickiest eater on the planet) loves both nutella and cream cheese frosting…so our romantic valentine’s dessert will probably be a bowl of frosting and two spoons! Are you kidding me??? Can eyeballs salivate? Thank you for your Blog! I found it a couple of months ago while searching for a meatball recipe. So glad I did! You are wonderful and you’ve really helped me in looking at things from another perspective as well as teaching me about cooking. I enjoy your beautiful talent for photography. Looking forward to your books too!! Sad truth: I have never tried nutella. These look amazing- never thought to combine 2 of my favorite things, Nutella & cream cheese, but I will definitely be trying it for VDay. Thanks for sharing. I don’t talk in ounces. Can you help me out? The recipe says that I need 8 ounces of cream cheese. I ‘think’ that means about 250 grams. Is that correct??? Sorry, I bet it’s frustrating to always have to convert. 8 ounces of cream cheese is 226 grams, to be exact. Can’t wait to try this – nutella is truly amazing! 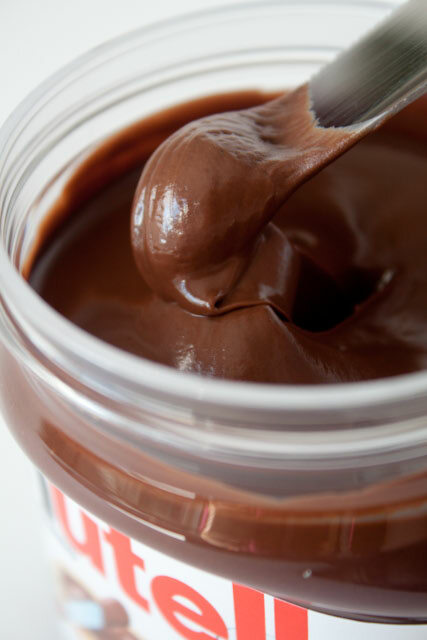 Have you ever tried making your own nutella? I’ve seen a few recipes floating around Pintrest but always use the jar from the store. No, I haven’t tried to make my own, but I really should! Seems like it would be fairly straightforward; it’s just–I love that perfectly made jarred stuff so much already, you know? I’m excited to try these for my loves for Valentine’s Day. 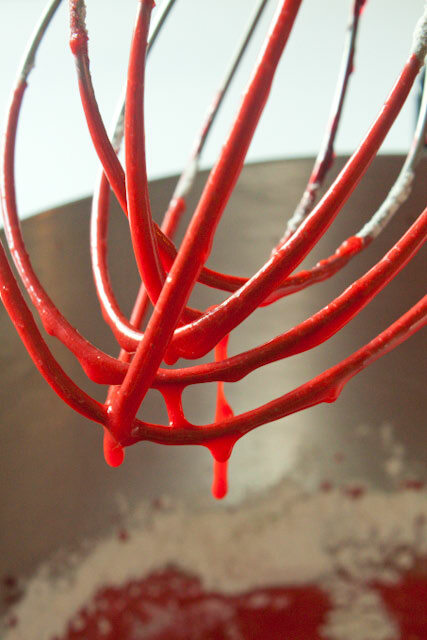 I may cheat a bit and just use a box red velvet cake mix for cupcakes as my time to prepare is limited. Wondering if I add Nutella to already whipped cream cheese frosting if it will be pass or fail. They look beautiful. I am also putting candies inside the cupcakes for a surprise. Now I just want to go home and bake!!! Thank you for the inspiration of Nutella. Sincerely, a Nutella Addict, I’d go to meetings but I don’t want to quit! I want one of your cupcakes if there will be candy inside! I’m not sure if it would work adding it to already whipped cream cheese frosting? It would probably be a little bit looser in consistency, but tasty nonetheless. I know it’s a bit late to the party as Valentines Day was over two weeks ago, but you can add unsweetened, alkalized (Dutch) cocoa powder (maybe 1-2 cups) to thicken up the frosting so it’s pipe-able. Just mix it in along with the powdered sugar, before the addition of nutella. And by “before the addition of Nutella,” I meant “AFTER the addition of Nutella.” Sentences are hard. Your recipes look great! However, I wish that the calorie information was included. Can I just say that I am a STAR! I made German chocolate cupcakes with the Nutella Cream Cheese! A M A Z I N G! I read all the comments about piping and what not…so I did add a little more powdered sugar…it was fantastic! Then after the whole cupcake experience, we went BIG with a whole cake and added more cream cheese to make the filling and I think my little family ate the whole cake in a day…we are now watching weight loss videos…watching. Thank you so much! LOVE LOVE LOVE! First I want to thank you for taking the time to share your lifes journey as well as all of these lovely ways to eat healthy. My husband and I are morbidly obese and have been for a long time. We have both started the long process of weight loss… which I have done twice before… 110 pounds the first time and 72 the second… now looking at needing to lose 125. These recipes have been a life saver for my husband! To be able to feed him such yummy things and that are already portioned has really made things so much easier. Thank you for everything you do and your time spent helping the rest of us. First – oh my oh my I can not wait to try this frosting! It looks delish! Second – a logistical question. Since this is cream cheese frosting will I need to keep my cake in the fridge from the time I make it until it’s served?? Or does the sugar content somehow make it ok to sit out (in a closed container)? I’m making a cake on a Friday night to be served Sunday afternoon.. fridge or no?